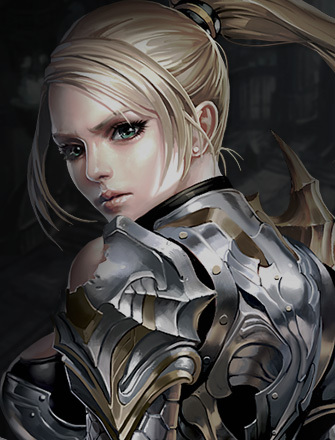 Join Mission War to represent your nation in one of the most grueling PvP battles in CABAL Online! Whether you choose to battle in Tierra Gloriosa or Memoria Chrysos, you have the chance to represent your nation with pride until the end. The victors and the best champions are rewarded after each Mission War! You must belong to a nation (Procyon or Capella) and be between levels 52 - 200. 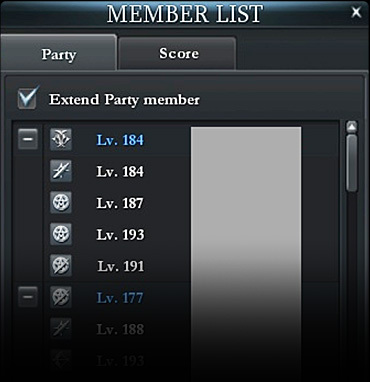 When prompted by the system before the start of each new war, select the check mark to enter the lobby. 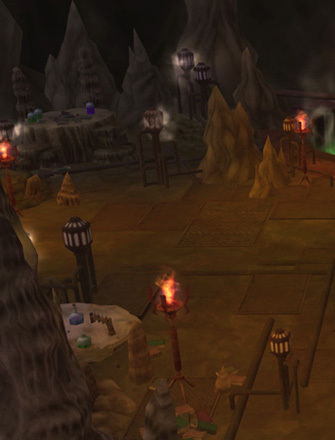 If you are between levels 170 - 200, you have a choice between the Memoria Chrysos and Tierra Gloriosa maps. Saturday 18:00 (Server Time), Tier 5 (Lv. 170 – 200) Winning nation will win bonus benefits for the week. The Mission War report is printed 30 seconds after the end of war. 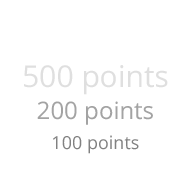 Rewards vary depending on obtained points and criteria for each tier (rewards are obtained from mailbox). If one nation wins war with a called game, Mission War ends even if there is remaining time on the counter. 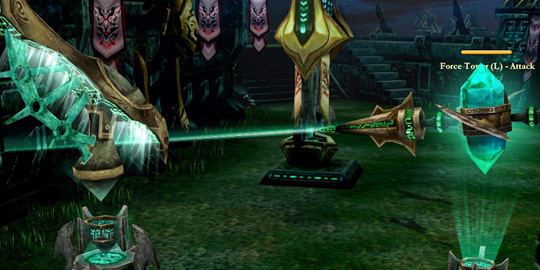 The Battlefield is where the true action takes place in CABAL Online. Become part of a nation to join the Revolution of Action! 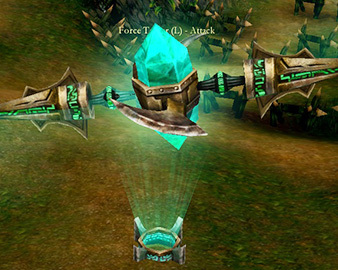 Force Towers give allied players buffs, such as defense increases and various special abilities that can be used to attack enemies. There are two types of towers: Free-build type towers and Normal-build type towers. 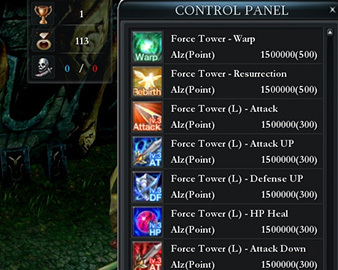 Force Towers can be built using either Points or Alz. Force Towers can resurrect, teleport, and buff players, as well as attack and debuff enemy players. There are three different Force Tower sizes: Large, Medium, and Small. 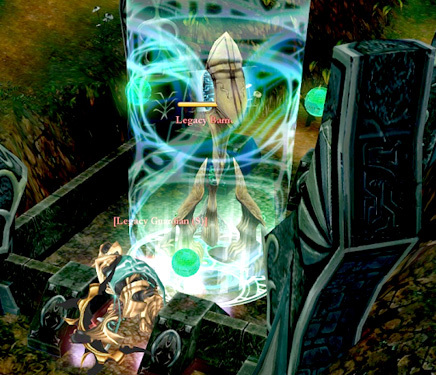 Players may click an allied Force Tower with low HP and press R to repair the tower with Alz. A player who is repairing a tower cannot use any other functions until the tower is completely rebuilt. Constructing a normal build-type tower is only available by using FT panels at Strategy Points or bases. Attack, Buff, Debuff, and Special types are available for each FT panel. If the base or Strategy Point is being captured by enemies, the Force Tower will collapse. Use a mobile FT panel to build Force Towers where you wish to Attack, Buff, or Debuff your team. Towers cannot be built in close range of each other. Force Towers collapse after 3 minutes. * Mobile FT panel can be purchased at the Mission War lobby from the Grocer NPC. * Once in the battlefield, you can purchase Vital Gear (HP, SP), and a Mobile FT panel via the Remote Shop (Hotkey: N). The start location when you enter the battlefield. Each regiment has one base. Inside the base is the Sage’s Ensign what represents the nation. If Sage’s Ensign gets destroyed the enemy will capture the point. The symbol of the base. If the Sage’s Ensign gets destroyed, the ownership of the base transfers to the opposing nation, and the Sage’s Ensign being summoned to them. Sells Mobile FT Panels. Exists only inside the base. It is indestructible and not available to build. The main entrance to the base. No restrictions are applied to allied members, but members of the opposing nation must destroy it in order to enter. FT Panel can be used to build Force Towers. Normal and mobile types are available. Mission War begins with standard contructed Force Towers. If the enemy captures a Strategy Point, the surrounding Force Towers will be destroyed. Strategy Points exist in specific locations inside the battlefield depending on the size: Point (Large) / Point (Medium) / Point (Small). 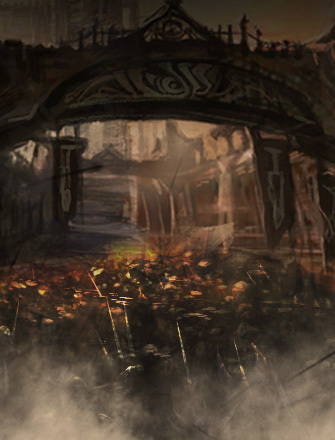 Each Strategy Point has a Legacy Core and destroying it will allow the enemy to capture it. Symbol of the base. It is neutral when Mission War begins. The barrier that protects the Legacy Core. If it is destroyed, the team will be able to obtain that Legacy Core, and it will attack the enemy team. 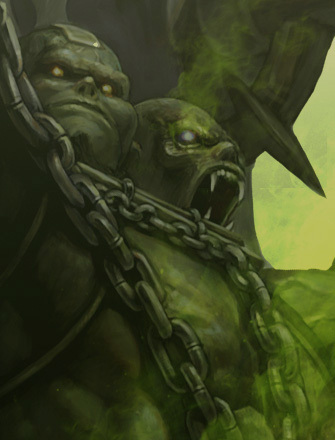 A monster that defends a Strategy Point. The size, shape, and attack power of the Guardian differs depending on the size of the Strategy Point. 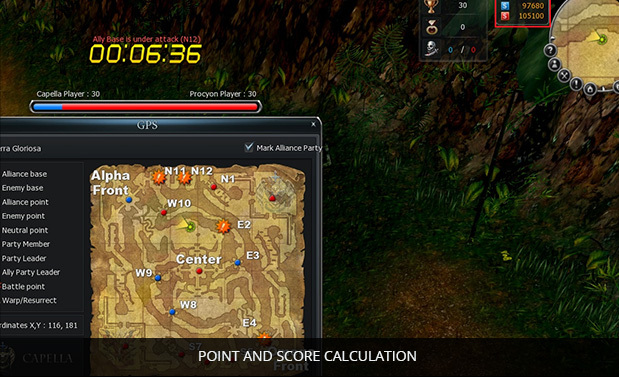 A player can click and destroy the Legacy Core to capure a Strategy Point for their team. 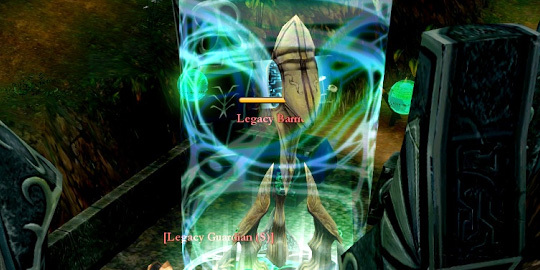 A Legacy Barrier will shut down automatically once its Legacy Guardian is killed. Clicking on the Core will capture the Strategy Point, and once it is captured a new Legacy Guardian will spawn to protect the Core. You can earn points and a final score during Mission War. Points can be used to build Force Towers or summon Legacy Guardians, while scores are used to judge the final result of the Mission War. When a nation earns the maximum reachable score, they win. When a nation captures all strategy points located within the battlefield, that nation automatically wins. Mission War starts with standard strategy points. Every 3 minutes you earn points when you capture a strategy point. After the regular Mission War schedule is over, the nation who has a higher total score wins. 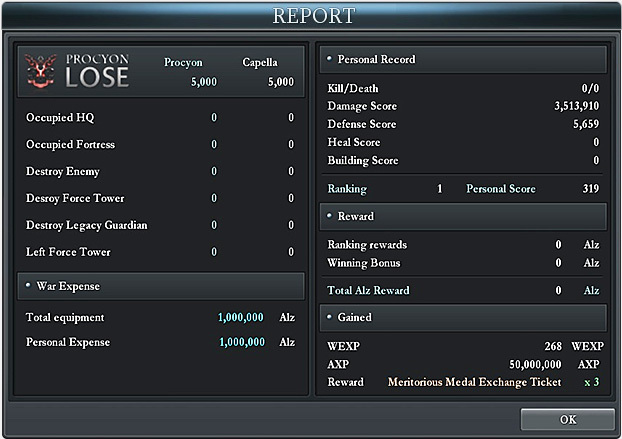 The result of Mission War will be judged by scores. If Mission War ends naturally, the result will be decided by the score. Destroy Legacy Core of enemy strategy point or neutral strategy point. Destroy Force Tower of enemy strategy point or neutral strategy point. 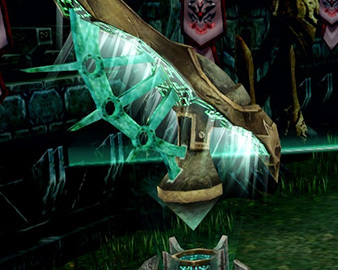 Kill Legacy Guardian of enemy strategy point or neutral strategy point. The remaining HP amount when the Mission War ends.